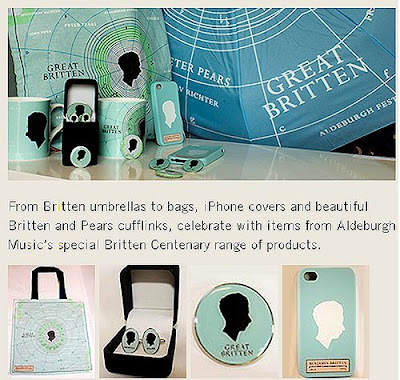 "They are a limited edition, so you will need to be quick…" trumpets an email from Aldeburgh promoting the Britten centenary merchandise created by design consultant Kit Grover; the goodies are seen above and include an eminently resistible Britten shopping bag. Despite being so close to the North Sea, the keepers of Britten's flame have failed to spot that the tide is finally turning and that even their peers in the pop industry have realised that audiences are “switching off because they feel their intelligence is being insulted”. And this thread is about much more than my personal dislike of composer anniversary tat. Neither Aldeburgh Music’s Twitter feed nor that of @BrittenOfficial made any mention of Jonathan Harvey’s untimely death on December 4, despite the personal links between the two composers. But in the same period there were tweets asking “Who’d like some Britten & Pears cufflinks for Christmas?” (Dec 7) and “or…what about an iphone cover?” (Dec 8). If you are looking for a Britten related gift I would recommend saving £19.99 on the Britten & Pears cufflinks, and instead spending £17.99 on A. M. Garnham’s overlooked but important Hans Keller and Internment which documents Keller’s development as a musician and writer during and immediately after his internment in Britain as a ‘Hitler emigré’. Keller is an very important figure in twentieth-century music in his own right, but was also a major influence on both Benjamin Britten and Jonathan Harvey. Alison Garnham’s book has additional merit as a pioneering study of internment camps, an insidious institution that is overshadowed by its more mediagenic cousin the concentration camp. In April 1936, with political tensions near breaking point and just three months before the outbreak of the Spanish civil war, Britten travelled to Barcelona for a contemporary music festival which included the premiere of Berg’s Violin Concerto. Also at the festival was the Catalan composer Xavier Montsalvatge; in a footnote to his admirable biography of Montsalvatge Roger Evans cross-references to Humphrey Carpenter's life of Britten and writes: “Britten does not seem to have engaged with his Catalan contemporary and seems to have been far more interested in hearing polyphony of Victoria in ‘a rural monastery’ – presumably Montserrat Abbey – and exploring the red-light district with Lennox Berkeley”. None of which detracts one iota from the greatness of Britten’s music. But it is relevant to the composer's recent elevation to poster boy of the performing arts, and I have looked in vain through the generously funded Britten centenary events for a much needed seminar on ‘Britten – separating fact from fiction’. In April 1939, as the storm clouds of war gathered over Europe, Britten – whose pacifist views once led him to declare that “I believe in letting an invader in and then setting a good example” - left Britain for North America with Peter Pears. As Britten sailed for Quebec on the Cunarder RMS Ausonia, Republican refugees from the Spanish Civil War were being held in appalling conditions in internment camps in French Catalonia. Among those who worked tirelessly to help the Spanish refugees in the Argelès internment camp was another great musician, Pablo Casals . Last year I travelled to the site of the Argelès camp and described that moving pilgrimage in a post. Following my trip I discovered that double bass player par excellence Renaud Garcia-Fons' has composed an elegy titled Camp d’Argelès. This is dedicated “to the memory of the 100,000 Republican Spaniards who were interned in the Argelès camp after the retirada of February 1939” and is one of the tracks on his recent album Méditerranées. Renaud Garcia-Fons inhabits that penumbra between classical, jazz and world music where so many exciting things are happening. There is more about him and the memory of the nameless in Art in the age of mechanical reproduction. Those bloody cufflinks are absolutely beyond the pale. In fact, they give me the creeps. I might have speculated that Britten ignored Montsalvtage because of the latter's happy accommodation with the Fascist regime, but his blindness to the internment camps scotches that generous notion. All in all, this splendid post just causes me to observe once more that I have no idea how Britten came to be regarded a some sort of saintly figure. Music aside, I've never noted anything remotely likeable in him. Of those around him, many treated utterly shabbily, I should say that Imogen Holst, certainly, is more fittingly to be thought of as a saintly figure, and it dismays me that she devoted so much of her time and immense talent to Britten as, far more reasonably, she did to her father. What might she have accomplished on her own behalf had it been otherwise? Boydell & Brewer tell me that in spring 2013 they are publishing another Plumbago title Hans Keller: Benjamin Britten: The Musical Character and Other Writings.